The most treasured memories are the ones made with someone you love. What are your fondest memories? Was it the scent of mum’s freshly baked cake, or the warmth of dad’s hand? These simple but precious memories give us a sense of familiarity, a sense of “home”. A solid and comforting presence by our side, much like BROS water bottles. 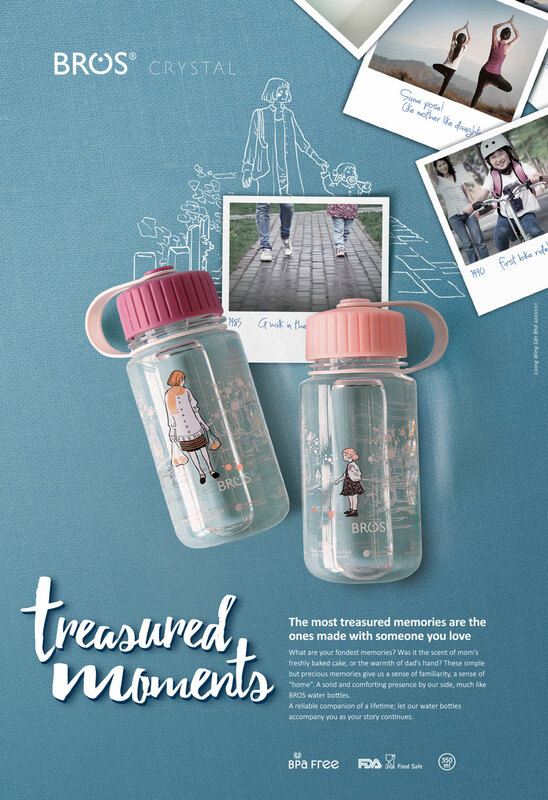 A reliable companion of a lifetime; let our water bottles accompany you as your story continues. Posted in New In and tagged Crystal. ← NewerBROS Capa | Must be Capa! Hi I have few of your bottles and 2 of them the cover was spoiled was wondering is that able to buy the accessories at any of your store or any shopping mall where selling bros bottle. P/s: We spotted your message on BROS Facebook. We believe that BROS FB team has contacted you. But feel free to let us know if there is anything else that we can help you with. What's Your Mug Looking for an insulated mug that keeps your hot beverages piping, and your cold drinks chilled for longer, yet reflects your personality and style? The six new Mug2Go design will suit a variety of taste being gender specific, neutral and reflecting highly definite tastes! Go out and embark on a journey of exploration, of thrills and adventures. Quench your thirst for life with BROS Crystal Plus+. BPA free, reusable, happily designed & fun to carry around. When Life hand you lemon, make lemonade. What happen when life offers you variety? When Life offers you variety, put on your shopping shoes! Hot off the press! BROS Alooart water bottles. Intensely hued and sleepy polished, it’s good to be spoilt with choice. After all, variety is the spice of life!